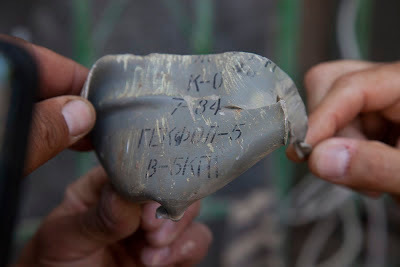 My eye was drawn to the markings, with "M220" possibly referring to part of an BGM-71 TOW, a type of US wire-guided missile, or the M220 propelling cartridge for M889A1/M889A2/M821A2 81mm high explosive mortar bombs. However, it wasn't clear how either would relate to this munition, so this device remained a mystery. 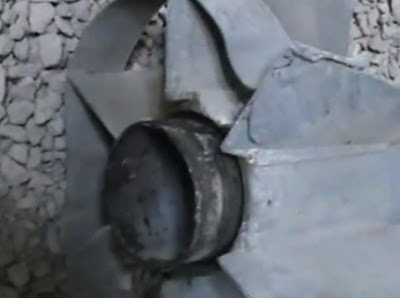 The enemy was applying a scorched earth policy by firing Iranian vacuum bombs, which caused whole building to fall down. He may not be referring to these devices, as there was a lot of ordnance being used, but I'd assume he'd know the bombs dropped by the air-force are all Soviet. So what is this device? These weapons were solely used by Jaysh al Mahdi (JAM) Special Groups, which were the Shia fighting groups trained/funded/financed/equipped by the Iranian Revolutionary Guard Corps and the Quds Force. If I’m not mistaken, only one group was really tied to the IRAM, and that was Kataib Hezbollah. Kataib Hezbollah shouldn't been mistaken for Lebanon's Hezbollah, but they do have some obvious things in common with each other. As the above New York Times article points out, this isn't the first time IRAMs have been spotted in Syria, with around a dozen videos posted so far. What is interesting about this IRAM is the design is very different from the others used so far, as appears to have a much larger warhead. The point re: the M220 is not that the warhead originated from either a TOW or a mortar round; that's not especially important, because obviously it is not either. It's that someone may have repurposed a munitions storage case instead of using a large pipe, water tank, small barrel etc for a DIY projectile. I was wondering if this looks like a design you've encountered before? The design in the photographs doesn't look like the ones we encountered in Iraq. Those generally used an acetylene tank for a warhead section. The fuzes were a pyrotechnic time-delay and were generally all of the same design. The tail section is very different from what we've seen in previous IRAMs, what are your thoughts on it's design? The tail section shown in the photographs is curious, and probably is one of several reasons this weapon failed to function as designed. The Fadjr-1 is an Iranian copy of the Chinese Type 63 artillery rocket. These rockets have six canted venturi nozzles that impart instantaneous stabilizing spin to the weapon, thus freeing it from needing a rifled launcher. Check this page for some diagrams. Thus, the added tail section is superfluous, and only adds weight to the tail. I suppose it's possible that the designer thought the addition would better help it fit into a cylindrical launcher, but this is really a cosmetic change at best and an additional destabilizing mod (on an already non-aerodynamic system) at worst. Here we can see the rockets were manufactured in 2007, which is co-incidentally the same date on a cargo of smuggled 107mm rockets from Iran intercepted by the Israelis in 2009. At the start of the video there's a truck mounted multiple barreled rocket launcher of a type I've not seen before. The rocket tubes seem to be very large, far larger than any system I've seen mounted on a truck, but possibly the correct size for the above IRAMs. The video quality is very poor, so it's hard to be certain, but this might be a first look at the system used to launch these IRAMs. Just over a month ago I finished my Indiegogo fundraiser, hitting my target, and guaranteeing I'd be able to work on the blog full-time until the end of the year. Thanks to the following individuals for donating, and making everything possible. A number of donors still haven't got back to me with their details, so if you feel like you should be on the above list after giving a donation send me an email at brownmoses@gmail.com with your reward level and I'll get you added. A couple of weeks ago I wrote about a group of opposition fighters who had just reached the center of Qusayr, which was at that time under siege by Syrian government forces, including Hezbollah, and the National Defence Force. Shortly after their arrival, opposition forces retreated from the area, allowing government forces to take control of the town. One of the people with the reinforcements was Colonel Abdul-Jabbar Mohammed Aqidi, a senior member of the Free Syrian Army's Supreme Military Council, who has now given an interview giving his version of events, which I've had translated into English. In it he talks about attempts to reach Qusayr, the situation he found in Qusayr, the retreat, Islamist and Jihadist groups, and the status of the Supreme Military Council. 0:01 Interviewer: we would like to know what happened in Qusayr. 0:04 Aqidi: We arrived at Qarah Mountains (جبال قارة) in Qalamoun (القلمون) area and we set up a camp. The initial plan was to enter Qusayr through Josiyah (جوسية) or al-Abboudiyah (العبودية) or through Shamseen (شمسين) in order to lift the siege of the town and relieve our comrades there. I am going to tell what really happened at that point. 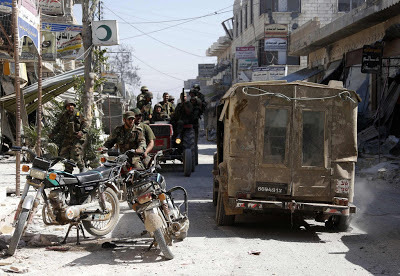 Unfortunately, the military council of Qalamoun did not cooperate with us and we found that many fighters there are smugglers and not true revolutionaries. We stayed there a period of three or four days during which we reconnoitered the area and set up plans. Unfortunately, the fighters in Josiyah and Sheikh Ahmad Ammon denied us support. We decided to enter Qusayr at all costs and though we do not know the area very well. Our first attempt to enter the town failed due to lack of scouts, and I told my men that we are going on a suicidal mission, and that I welcome all those who want to go with us. In the second time, we crossed the highway and then we lost the scouts. On our way to the town, land mines destroyed three vehicles and killed thirteen men. After two days, we arrived in Qusayr, and we found that some commanders had already decided to retreat, but they changed their minds under pressure from the civilians, who rejoiced at the news of our arrival. The commanders’ reaction to our arrival was unlike those of the civilians and the fighters. Anyway, on the following day we held a meeting with the commanders of the seventeen formations that were fighting in Qusayr. During the meeting, al-Saleh and I told the local commanders that we were there to fight under their command as soldiers not commanders. However, fourteen local commanders voted for retreat from the town. I then told them that we were going to die in the town and would not retreat. This made them feel that they should not give up the town and decided to stay and fight. We set up headquarters the following day and started preparing ourselves for the battle. We noticed that the senior officers who defected from the Assad army were marginalized and did not have a say in the decision-making process. After the meeting, every senior officer was tasked with holding a sector in the town. We also set up a legal court in order to penalize wrongdoers and defeatists who we expected may flee the battlefield. In spite of all our well-organized preparation, some local commanders were still thinking of retreat. Honestly, we started to understand their primary concern, which was the high number of wounded civilians and fighters. The problem of the wounded was the most worrying for the local commanders who sometimes insisted on evacuating them. The next day I took a tour to the front lines, and sometimes I was just few meters from the enemy. The fighters’ morale was greatly boosted by my tour. On the third day, we launched an attack on al- Daba’a (مطار الضبعة) air base, killed thirty-five enemy fighters besides destroying two tanks, and captured a tank and a 106 mm gun. However, enemy forces attacked the southern side of the town on the fifth day and we suffered many casualties, which led to deterioration in the morale of our fighters. At this point, the commanders held a meeting and discussed the next steps. The discussions were intense and the commanders were extremely nervous that they showed disrespect of each other, so al-Saleh and I left the meeting, though Doctor Mazen Matar and others tried to calm the situation down and persuaded the commanders to hold their ground. Two or three hours later came the head of the military council and urged me to leave the town because, according to his words, al-Saleh and I were two symbols of the revolution and that he was concerned about our safety . At first, we refused to leave but three hours later we knew that almost all the local fighters had retreated. Then we were forced to retreat to the village of al-Dabha (الضبعة) where civilians and fighters gathered. The village was under artillery and aerial shelling. The fighters planned to evacuate the civilians on foot and leave weapons and vehicles behind. After sunset on that day, we began retreating but the severe shelling from all sides forced us to seek protection in the orchards. There were more than ten thousand people hiding there including fighters. The enemy was encircling us from all directions and those who fought back were fighters from Aleppo, Deir Ezzor and al-Nusrah Front and few local fighters. It was like doomsday but we managed to escape. Honestly, holding Qusayr was very much like a suicidal attempt and local commanders were excused to leave the town due to high casualties besides the huge psychological pressure they were put under. The situation of the wounded was beyond description and their wounds were terribly infected. The enemy was applying a scorched earth policy by firing Iranian vacuum bombs, which caused whole building to fall down. 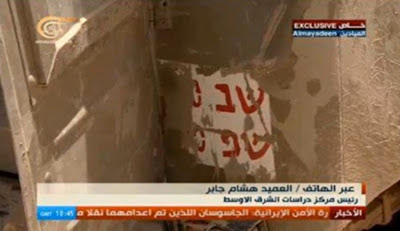 This was forcing the fighters to retreat to another building. Other problems were the lack of proper communication between the commanders and their men as well as the absence of joint headquarters and the worst of all the distrust among the local commanders. We lost a battle but we did not lose the war, and what’s more important is that we should not make of Qusayr the symbol of the revolution. Though we have been fighting in Aleppo for over a year and a half, we have not seen much devastation and destruction like that we saw in Qusayr. 12:23 Interviewer: What about your relations with Islamist battalions? Aqidi: I have good relations with all of them and I am communicating with them as long as they fight against the Assad regime. 13:55 Interviewer: What about the execution of the fourteen-year-old boy in Aleppo? Aqidi: Once I arrive in Aleppo, I am going to investigate it. I am sure Islamist groups are not behind this act. Some groups claim to be Islamist or FSA but in fact, they are regime-made and consist of secret police and shabeeha. Last week a brigade commander was trialed and executed because his acts were doing harm to the reputation of the FSA. His name was Mahmoud [.........], he headed the Unified Army of Muhammad, and his deputy’s name was Abu Taleb. Syria does not need foreign fighters because this will make it another Afghanistan, what we need is arms and money. We prefer arms to money because the latter is spoiling the revolution. Syrians alone can liberate their country and even Lebanon from its thuggish Hezbollah. Aqidi: First of all let me clarify that General Salim Idriss is not the head of SMC. General Salim is the chief of staff. SMC is composed of 30 persons, 6 from each front. 10 are officers, 19 are civilians. They’re detached from reality. They have no connections with inside at all. General Idriss is the chief of staff and we, like all other provincial military councils, are under his command. We communicate with him on a daily basis. (or sometimes every 2-3 days according to availability of communications) . As for the SMC they are located in Bab Al Hawa, and some of them are inside, some in Saudi, some in Lebanon… But majority are in Turkey. They’re disconnected from reality. In fact I’m a member of this SMC but I don’t attend their meeting and they don’t matter to me. They lately held a meeting and cancelled my membership after I threatened to fight Hezbollah on their land in Lebanon. I regularly communicate with General Idriss. I've also been told he also says that they tried to get him sacked because he said the FSA would attack Hezbollah inside Lebanon and that this came from Okab Saqr (who's a Shite from Lebanon) and Louay Miqdad whose mother is a Shite, and he ponders why they would want to have him sacked. Thanks to Kristyan Benedict of Amnesty International whose donation to the Brown Moses Blog fundraiser guaranteed the continued existence of this blog. It shows what is supposedly some type of rocket or missile embedded in the ground, supposedly fired by Syrian government forces. What's odd is it doesn't appear to match any design of rocket or missile I could find, and seemed as if it could be a DIY weapon. It certainly didn't match any of the DIY rockets I'd seen used by the opposition, and I even suspected it could have been some random piece of junk. You'll also note in the above pictures that in the position of the bolt or screw between the tail fins in the January video there's a hole in the June video, possibly that once held the same sort of bolt or screw. So it seems clear these are the same design, but the questions remains what exactly they are? It doesn't appear to match any design of rocket or missile I can find, which would imply it's possibly a DIY rocket, or something locally produced that hasn't been seen before. I'd even consider it's the same rocket in both video they've filmed twice after doing some additional damage, but so far it remains a mystery munition. To begin with, could you explain the aims of your project? Sure, though because the aims of the project are not specific, the answer to this question is more a spiritual or philosophical one. I simply heard about the crisis in Syria and the huge numbers of refugees and thought, "Somebody needs to go be with them." First of all, presence-with isn't necessarily something that's valued in Western culture, so that right there is a thought that's pretty cutting-edge in the development conversation. The lack of a clear plan and spreadsheet is difficult for bureaucracies in international aid and development to work with. But whatever arises from that "presence with" is something I'm unwilling to try to predict, and this commitment of mine to uncertainty and the "roll-with-it" approach in development work ended up garnering the attention of USAID (who put my essay about uncertainty in development work into 2012's "Frontiers in Development" book) and Hillary Clinton (who supports my project in the book's introduction). I'd like to keep testing the theory because I'd like to offer the development sector more tools to engage respectfully and positively with populations in developing countries and post-conflict zones, and be able to explain not just the principle itself of "we'll see what happens" but tell stories of how that methodology has done in action. I'd like to apply that methodology with Syrian refugees because they're suffering a great deal, and I'd like to raise awareness of their plight as well as perhaps help to alleviate it with the few I may be able to meet in person. Depending on how things unfold, I'll react to the realities of the environment in Turkey, the factors of which include how much access I'm granted to refugee communities, in ways that align my skill set (writing and the arts, mainly) to the situation. I may write a series of Huffington Post articles about what I see on the ground out there, or I may have the opportunity to connect with refugees and create an arts project with them. At the very least, I can create that much more awareness with my ability to write articles and blog posts; at the most, I can directly impact the lives of these humans who are suffering in positive ways. Like I said, I simply believe someone should go be with them, and because I've done refugee work beginning with that simple maxim before and met with success in Africa and Asia, I thought that person might as well be me. I don't believe in moral imperatives for anyone else, necessarily, and I wasn't raised with religion. I am agnostic, but I do believe in the sacred nature of bearing witness to the lives and suffering of others. And before the advoacy, before the writing and the going to UN compounds in Ulaanbaatar and Nairobi, there was simply presence with these people. Humans who had lost their homes and undergone unspeakable trauma on an extended basis. You say you have a five-year track record of successful refugee advocacy in collaboration with the UNHCR in Asia and in Africa, how do you think those experiences with inform your work in Syria? My experiences of success with refugee advocacy give me confidence in the "roll-with-it" approach that I'd like to offer in Turkey. My informed guess is that I'll be able to do something useful for refugees there, but that I don't know exactly what yet. When I went to Mongolia for a year as a Henry Luce Scholar to serve the Mongolian Writers Union as their International Relations Advisor in 2007, I didn't foresee I would be accompanying an exiled writer from China to the UNHCR to ask why he hadn't received refugee status. It was there to be done, and I could do it, so I did it. Five years later, the writer is safe in Brooklyn, living with his wife and daughter for the first time in almost a decade. Over the course of those years I had successfully nominated him for a Human Rights Watch Grant, told his story at the 2010 Writers and Literary Translators International Congress in Istanbul, given interviews about him for Global Shift, and wrote about him for the Huffington Post. I did what I could do, given my skill set. It went well--and also wasn't something I could have planned beforehand. But I showed up in Mongolia, the way I'll show up in Turkey, and that was the first step. I also showed up in Kenya in 2011, with the idea that I'd work with refugee girls to do an arts performance for World Refugee Day, but I had no other specifics in mind. I didn't know there would be six of them, that they would be Congolese, that they'd want to do theater, that they'd want me to direct their play, and that they'd want to create an original piece of theater about the gender-based violence they had suffered. The girls taught me a great deal of important things, not the least of which is that human beings tend to know what they need--and Syrian refugees, I imagine, will be no exception. The remedy was within the girls: they knew what they wanted to talk about to recover a bit from their trauma. What I did was facilitate a "safe space" for them in workshop where they could begin to share and address their feelings of shame and fear, then create original art out of that process. The basis of my work with refugees is not the assumption that I know what they'll need, but that they know what they need. When they let me know, I do what I can to facilitate that happening. The girls in Nairobi have kept the project going, a self-sustaining theater group called the Survival Girls that's two years old now, with triple the original membership and contracts to perform all over the city. It's extraordinary to me, as a non-international-relations major, a non-political scientist, that this is as unusual as it is in those conversations--but the presumption that we know what people will need remains a strong undercurrent to a lot of "old-school" development sector conversations. I feel it to be very important, as an American, to demonstrate my American-ness as an aid worker by facilitating, rather than leading--by listening, rather than telling people what they need to know or need to do. I'm not going to Turkey to boss refugees around, I'm going to be there with them because I feel that someone should. I've written this elsewhere, but I believe I express the best of the country I love that I call home, America, when I treat silenced and marginalized world citizens like they have a birthright to life, liberty, and the pursuit of happiness. Syrians have been denied all three. It seems like the Syrian conflict will go on for a long time, with refugee numbers in countries bordering Syria continuing to increase. In your experience what challenges do you think these refugee communities will face? Honestly, I unfortunately think the crush of people in need--severely traumatized people who don't even have consistent food and water--is going to outgrow whatever space alloted to them by host countries. And it's generally true the world over that citizens of host countries often practice negatively prejudiced treatment of immigrants and refugees. The strain on host countries' resources is considerable, and that strain as a root cause of frustration residents feel is therefore understandable, but the fallout is almost always racial and social profiling wherein refugees experience life as second-class citizens. I think most people at this point are of the opinion that this war is going to be a long haul, which means refugee settlements will become de facto residential communities without the sanitation and other amenities "developed" areas offer. The entire situation is extremely grim, as I have heard from Turkish people I am in communication with about pervasive resentment of the Syrian refugees who are already there because of the strain on Turkey's resources, and there promise to be hundreds of thousands--maybe millions--more Syrian refugees there within the next few months and even years. In your opinion what do you think the long term situation will be for the international community when dealing with the Syrian refugee crisis? Because of the situation outlined above, I think it will be the existence of long term refugee camps whose citizens don't have basic amenities, enough acceptance and/or citizenship to work legally in host countries, or the assistance they need to recover from trauma to the point that they would even be capable of performing those jobs. We face an unsustainable strain on host nations' resources and a group of people who are too traumatized to function as citizens normally do, and who are also routinely kept from working legally in host countries. We're looking at instability spreading to host nations as a result of the concomitant discord, and the situation in Syria will deteriorate the situations in host nations--not because Assad has run his armies beyond the borders of Syria, but largely because of this unsustainable system in place for the reception, or lack thereof, of refugees. In my opinion, the long term solution would be a fairly massive overhaul of the attitudes that run our societies on a global scale. The perceptual coin of the realm, nationhood, is a concept we're going to need to question as the combined numbers of refugees and internally displaced persons on the planet moves closer to the 100 million mark. Because today's youth are growing up in such a globally connected world, this might not be as far-fetched as you might think. I think the people who will run our future, the people who are young now, are well aware of the gaping holes in the way governments and societies work: the critical-of-authority faculty is part of being young, for one thing, but most young people, who make up 50% of the world's population, at this point hail from urban areas in the developing world...and so most of them have experienced the negative effects of the silencing and marginalizing that old ideas of nationhood enforce. What makes someone a citizen? What do they need to produce, or prove, to be accepted into a new society? Does everyone deserve the same things; if so, what? The international conversation will probably see a generation of people willing to pursue these lines of interrogation with frankness, rapidity, passion, and an eye for practicability, because with a population of 7 billion, many of operational frameworks that used to work for organizing people simply won't anymore. The refugee "surplus" is just one symptom of that. Human organization is always based on ideas, attitudes, and belief systems--and those ideas are likely to change as a result of an often-impatient youth demographic being the majority in a world where resources aren't allocated evenly. What do you think of the international response to the Syrian refugee crisis so far? I'm saddened and terrified by it. There has been a great deal of support--513 million dollars, I think, is what America alone has given--but that is still nowhere near what is needed. The crux of the issue is this: it's unclear who is responsible for helping people in need if those people are nationless. As an international community we still very much use that concept of nationhood to attribute responsibility for people. Government ostensibly exists to provide for its citizens and meet their human needs, and nationless people are governmentless: they're like the kids left behind after football practice because everyone else's mom and dad came to pick them up already. I think people still think--or old laws still govern--in ways that say 'if it isn't in our back yard, we won't deal with it.' Because the need for resources in refugee communities is staggering, caring for those communities is something of a hot potato. To continue with my imperfect analogies, no one wants to bear the burden of raising a child that isn't theirs when they all already have "their own" children and this adoptive kid will need a lot. In that way what's at issue here really is this elemental human tendency to shut out non-clan members, to prioritize the people we conceive of as in our primary sphere. When the international community begins to act more often according to the notion that all nations are responsible for caring for those displaced by war and famine, we might see some cultural and political sea changes with respect to the issue. But the international response to a refugee crisis is inextricably linked to the international response to the war or famine that begot it. For example I think America, which is a country I love very much and feel very lucky to be a natural citizen of, loses credibility by drawing lines in the sand as to our involvement and response to war crimes. In a general sense, for me as a fairly young person myself, I'm kind of going, "As a society and an international community, we saw this in 1945; we said 'Never Again'. We saw this in Rwanda; we said 'Never Again'. What are we waiting for?" But I also know that beyond the basic terms by which we'll either enter the fray or not, things are very, very complicated. Ideas change before the laws reflecting them do, and international intervention is, in the view of human history, still a fairly young practice and the international community continues to work out the implemented procedure of it once it'd decided upon. Even the Geneva convention beginning to address the phenomenon of refugees didn't come along until 1951. And the years since then have dramatically revolutionized many systems, of organizing people, of organizing data, of organizing authority, and laws and policy are slower-moving and always playing catch-up. You yourself are evidence of how the internet and smartphones have affected the world: how an individual citizen who hasn't been trained to be a soldier can still choose to review and analyze youtube footage, and then to supply valuable information on arms tracking inside Syria. The technological age in which we live has also profoundly affected the centers or "nodes" of moral authority in our societies, which is no small thing when we look at the fact that responses to war and war crimes, international intervention and what it entails, are shaped by morals. Groups like Anonymous and individuals like Snowden are nodes of moral authority because they have the means of acting on moral convictions in ways that affect governments and disrupt societal systems. Their reasons for doing so are based on what they think is right. Our bishops and presidents are not, in other words, the only ones deciding such convictions for us anymore. Now you can, or I can, or a low-level CIA contractor can. I've long been an ardent fan of Anne-Marie Slaughter and Ronan Farrow, who are both active on Twitter and who have both logged time working for the U.S. State Department at top levels (as special advisor and policy planning director, respectively). I agree with what Dr. Slaughter has been saying for two years, which is that we need to act on Syria to address the war crimes, uphold our values, and maintain any kind of international standing; I also agree with what Mr. Farrow tweeted recently--that there's no clean solution to Syria, and the bedfellows required to try and end this violent mess of a massacre would come back to haunt us. Syria has become a proxy war--which your own work elucidates by virtue of tracing weapons' origins, makes, and models to supplying countries--and as such, the humanity of refugees and casualties is lost because, to a worrying degree, they're not what's at stake to the leaders in big fancy positions in developed countries, because those leaders are using this conflict to arm wrestle with each other. The humanity of people is denied when those people are used as surrogates for what is essentially an ideological conflict between leaders of nations with opposing economic and political frameworks. Perhaps the worst idea of all in this whole thing is that powerful nations are willing to sacrifice untold numbers of people from countries far away in order to prove a point...because when that happens, it's not even a question of what makes someone a citizen anymore. It's what makes someone a person. Proxy wars guarantee dehumanization, and it's horrifying to see the "great" leaders of "great" nations consciously participating in one, especially one as bloody as this. You can donate to Ming Holden's Kickstarter, In Search of Syrian Refugees & Their Stories, visit her website to read about more of her work, or follow her on Twitter. An Israel Defense Forces spokesman told the Times of Israel that "based on the identification number seen in footage of the vehicle, the jeep had belonged to the now-defunct South Lebanon Army, and had been out of commission for more than a decade," adding the report was "crude propaganda." Looking through images from the recently captured Qusayr one stood out, captioned "Forces loyal to Syria's President Bashar al-Assad ride on a truck in Qusair, after the Syrian army took control of the city from rebel fighters, June 5, 2013. Syrian government forces and their Lebanese Hezbollah allies seized control of the border town of Qusair on Wednesday, a severe setback to rebel fighters battling to overthrow Assad." 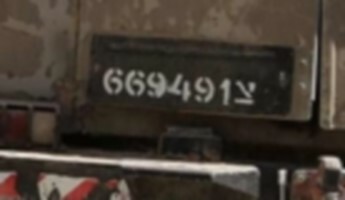 It seems pretty clear both number plates read 669491, so it's seems it's the same vehicle, and again begs the question of whether this truck was actually seized by Hezbollah from the South Lebanon Army and used for propaganda purposes. This is also important when footage shown on Syrian and Lebanon TV claims to show Israeli weapons supposedly captured in Qusayr. 0:01 Attendees are chanting typical Shiite slogans, such as “Oh Hussein”. Hussein is the son of Ali, from whom the word Alawites, or Alawi(s), is derived. He is a reverend Imam among the Shiite sect..
0:22 General Muhammad Khaddour (Khaddour is a typical Alawite name): We will raise Hussein’s banner in Minnagh [airport] and will fight under his banner. 0:45 General Muhammad Khaddour: We are seeking martyrdom because we have been martyrs for a very long time,(Referring to the year 680 AD, when Hussein was killed. Shiite Muslims see him as the grand or first martyr.) also we are believers and we believe in fate. I hope that you don’t show fear or hesitation as fate can’t be resisted. I also assure you that we will get to Minnhagh and that we will relieve our comrades there. They are waiting for the fighters of Nebbol and Zahara’ to rescue them. 1:28 the attendees chant: We sacrifice our blood and soul for you Bashar [al-Assad]. 1:40 I promise that all participants in this campaign will get government jobs after the campaign is over. Concerning those who choose to stay with us, they will be considered as volunteers. Both towns will keep bristling with arms and men in the meantime and in the future. Those who have jobs will get fifty percent pay rise and I also promise that all Nebbol's problems will be resolved very soon. Moreover, both towns will become the capital of Aleppo countryside. 2:37 The attendees are chanting pro-Assad slogans. 2:50 I hope we’ll be able to gather again here to celebrate victory. I vow that all your needs are going to be met. First of all, we need to organize ourselves in groups. Each group will contain fifty men and I want a list of the members’ names. I know that you are brave; however, I hope that you don’t take uncalculated risks. I brought with me between two hundred to three hundred men and I want to complete the groups with men from both towns. The men we need for this campaign should be trained, able and experienced in fighting. Secondly, we shouldn't waste ammunition, as every single bullet is valued to us. Don’t shoot in the air and preserve your ammo. How many men are there with us here? 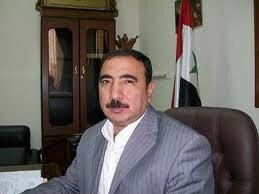 5:44 General Muhammad Khaddour: After you form the groups, I will hold meetings with every individual group. Tomorrow will be a showdown when we succeed in relieving our comrades and lift the siege of the airport. After we liberate Minnagh we will bring with us part of the equipment stationed there in order to protect both tows. Also some fighters will launch an offensive aimed at clearing the way that leads to Aleppo and link it with these two towns. This is necessary if we want these two towns to prosper. I promise to leave Aleppo and stay with you here once the victory is achieved. The groups will be headed by officers form the [Republican] Guard and by the officers who came with me here. Each group must be headed by an army officer. 10:10 un-named man is asking about the wounded in the city of Aleppo. 10:20 General Muhammad Khaddour: It will be solved. Don’t worry about them. Helicopters will supply us tomorrow with large amount of equipment. Now I want to see you in groups in the outside. 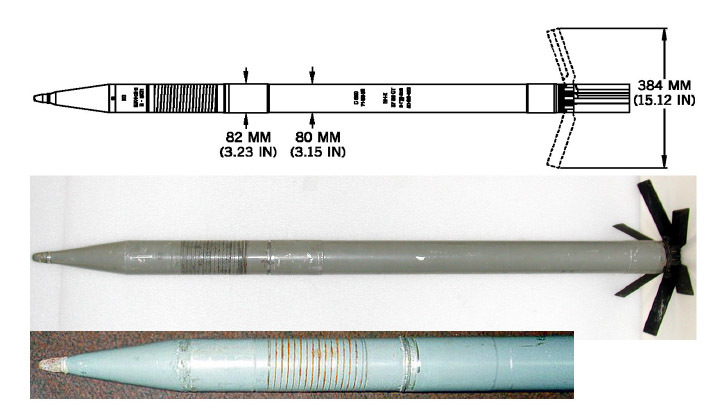 These photographs were reportedly taken in Harbnafeh, Hama, and show AO-2.5RT cluster submunitions, with very clear markings, showing they were manufactured in 1983. These types of cluster submunitions can be both dropped inside RBK series cluster bombs, as with the PTAB 2.5m or AO-1Sch types, or inside a KMGU/KMGU-2 container, like the recently spotted PTAB 2.5KO bomblets. Thanks to Nic Jenzen-Jones for help with this post. Hadi al-Abulluh (local activist): Those are some of the wounded who are besieged in Qysayr. There are about 970. Every day we try getting them out of the town but we can’t do so because of the siege imposed on us. There is no safe exit. International organizations didn’t reach us, neither Red Cross not Read Crescent. 1:20 Old man: We must help the wounded, there are more than 1200. Neither the European nor the Arabs are answering our calls for help. 3:15 un-named man: Why don’t the Muslims help us? 4:35 un-named man: I am one out of 1200 wounded. There were many attempts to get us out of here. Every time 50 try to get out only 25 return back because they usually get killed on their way out. Some of them died because of the shelling or as a result of the fatal wounds. Most of us here are civilians, nobody is doing anything to help us. 5:36 un-named man: The Arabs have left us alone dying slowly. We need men not money. 6:08 off-camera: We are improvising burial cloth out of blankets and clothes because they ran out. Many were buried wearing their clothes because we have no more burial cloth. It's interesting to note that at this point in the video air-to-air missiles can been seen, which despite some claims of them being US/Israeli missiles, actually appear to be the missile taken from Dabaa airbase, and turned into surface-to-surface missiles by opposition fighters, something I detail here and here. Over the past year an increasing variety of cluster munitions have gradually been deployed by the Syrian military, with the first individual appearance of cluster munitions recorded by Syrian activists in July 2012 being followed by a massive escalation in the use of the cluster munitions in October 2012. 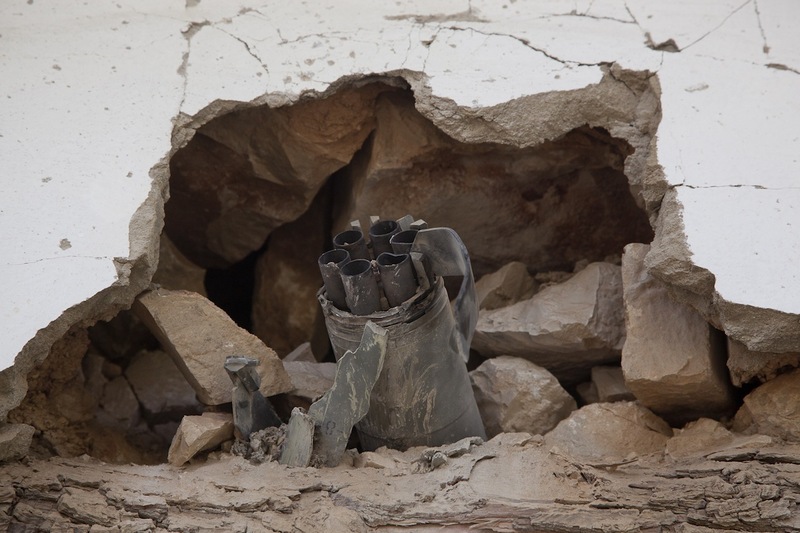 The following post details the cluster munitions recorded by activists so far in the conflict. The above video shows the first recording of cluster submunitions in the Syrian conflict, designated AO-1Sch. 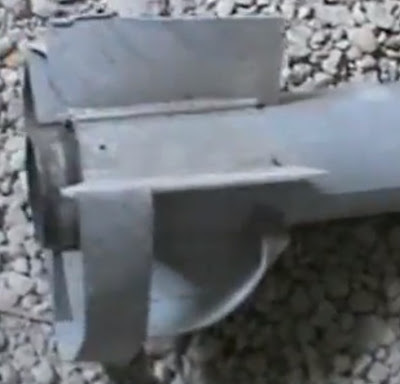 The video was filmed on July 10th 2012, and until October 2012 it was one of two examples of cluster bomb use in Syria. Originating in the former-Soviet Union, AO stands for “Aviatsionnaya oskolochnaya”, or "Aircraft fragmentation". These are anti-personnel munitions, dropped in RBK-250/RBK-250-275 cluster bombs from aircraft, with each cluster bomb carrying 150 AO-1Sch bomblets. The majority of these cluster submunitions that have been recorded in Syria were manufactured in the 70s and early 80s, with a few recent examples showing manufacturing dates of the late 80s. Large numbers of unexploded submunitions have been recorded, possibly because of their age and the degradation of the mercury based detonator. 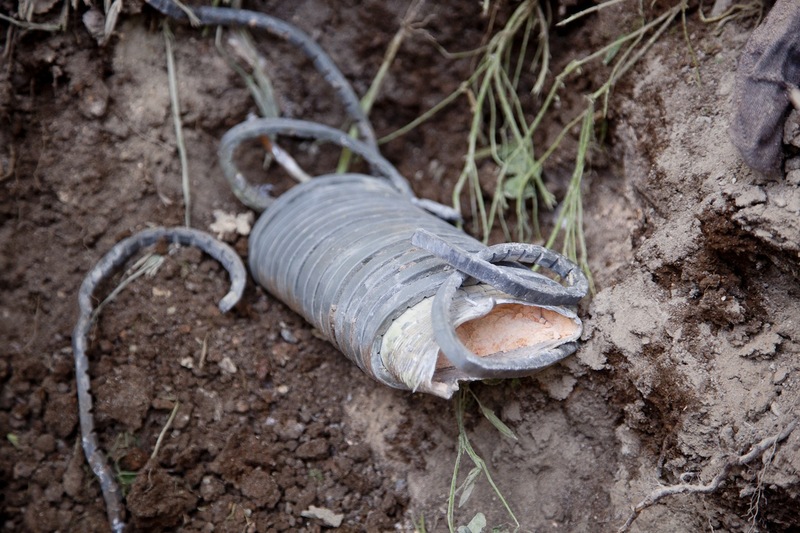 After their first isolated recorded appearance in July 2012 they reappeared in October 2012 when large numbers of videos started appearing online from across Syria showing unexploded cluster submunitions. 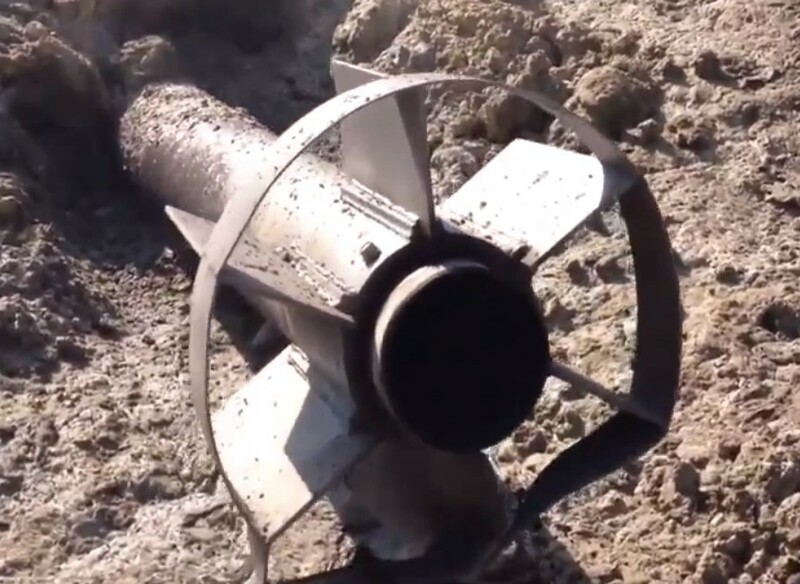 These videos appeared shortly after a major highway was closed by fighting in Idlib, and it's possible the escalation to the use of cluster bombs was a response to that. Much like the AO-1Sch, this is another Soviet-era munition dropped in groups of 30 inside a RBK-250/RBK-250/275 cluster bomb. These larger submunitions are designed primarily as anti-vehicle weapons. The above video shows their first appearance in Abu Kamal, on the Syrian side of the Syria/Iraq border in August 2012, and it is a good example of the handling of unexploded cluster submunitions that has been seen repeatedly in the conflict. The problem with unexploded ordnance (UXO) is there's no way to know if they are safe to handle, and could detonate at any time. As with the AO-1Sch submunitions this isolated incident of their use was followed by their use across Syria from October 2012 onwards. Along with the AO-1Sch submunitions they are the most commonly recorded type of explosive submunition used in the conflict, with hundreds of videos of their use posted online. In November 2012 a new type of cluster submunition appeared in the conflict, the ZAB 2.5 incendiary submunition. 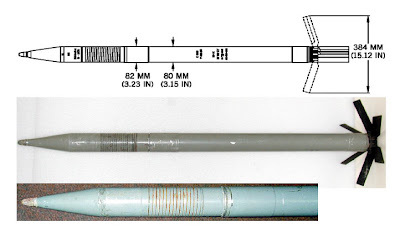 A Soviet submunition dropped from RBK-250/RBK-250-275 cluster bombs, this submunition is designed to destroy hangers, warehouses, and other large military structures. These submunitions have frequently been described as "white phosphorous", when they are actually thermite based weapons, which is extremely difficult to extinguish. Three types of ZAB 2.5 submunitions are used in each cluster bomb, with two types containing a bursting charge that cause the bomblet to explode some time after ignition, discouraging attempts to extinguish it, and spreading the burning thermite over a wider area. After AO-1Sch and PTAB-2.5m submunitions the ZAB 2.5 is the 3rd most commonly recorded submunition in the conflict. In December 2012 activists began posting videos of 122mm rockets, launched from BM-21 Grad multiple rocket launchers. This particular type was the Egyptian Sakr 18/Sakr 36 cluster munition rocket, each carrying 72 or 98 submunitions respectively. In the above video you see both the rocket, and the submunitions, which have a distinct white ribbon attached. When the rocket breaks open and releases the submunitions these ribbons cause the submunitions to start spinning, stabilising their descent. As this is happening the ribbon pulls out an arming pin, but in some instances this doesn't happen, so they landed unarmed. What can happen then is someone can come along, see the ribbon, and pull at it, arming the submunition, and causing it to instantly explode, killing anyone nearby. While they continue to be used in the conflict they have not been recorded on as wide a basis as the AO-1Sch, PTAB-2.5m, and ZAB 2.5 submunitions. A rarer type of submunition appearing in March 2013 was the ShOAB-0.5, another Soviet-era submunition, this time dropped from the larger RBK series bomb, the RBK-500. 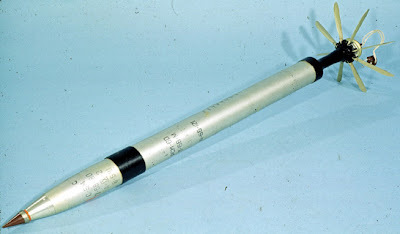 A copy of the American BLU-26, hundreds of these are carried in the RBK-500 cluster bomb, with each submunition carrying hundreds of metal ball-bearing, creating a devastating anti-personnel weapon. 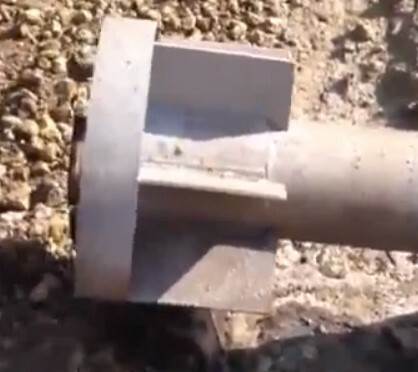 So far only a handful of videos showing these submunitions have been posted online. This 6th type of submunition was only recorded once in May 2013, and has a slightly different delivery method from other air-dropped cluster submunitions. The submunitions are carried in containers, and then released in batches, allowing them to be dropped in long lines, ideal for attacking convoys. So far no other videos of these submunitions have been posted online. 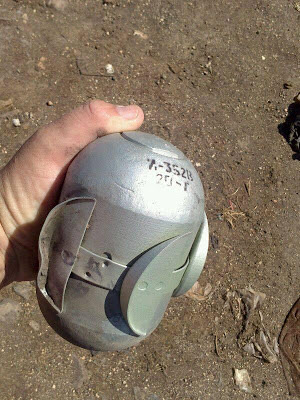 The latest submunition only appeared in June 2013 in Harbnafeh, Hama. These types of cluster submunitions can be both dropped inside RBK series cluster bombs, as with the PTAB 2.5m or AO-1Sch types, or inside a KMGU/KMGU-2 container, like the PTAB 2.5KO bomblets. 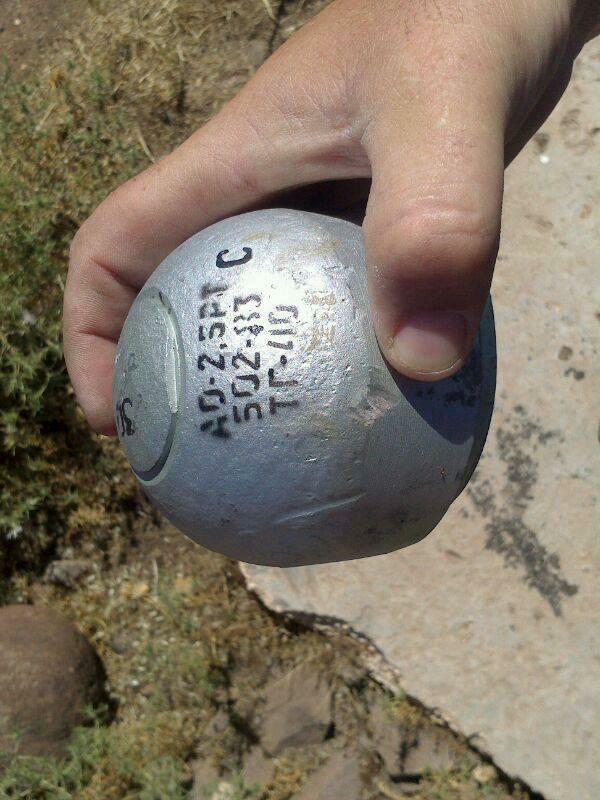 So far there's only one example of these cluster submunitions recorded in the conflict.